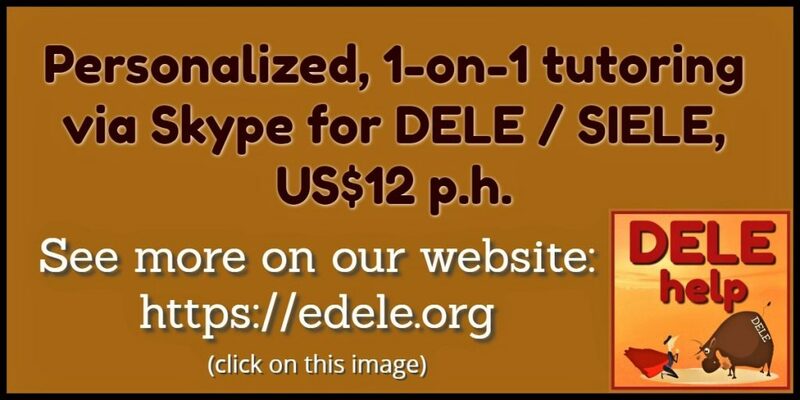 The DELE / SIELE exams are very different to traditional school or college exams. The examen DELE / SIELE tests your ability to express yourself in Spanish, coherently, fluently, correctly and with sufficient linguistic scope (i.e., vocabulary / lexis), simulating real-world situations. The DELE and SIELE are NOT examinations of your abstract knowledge of the “rules” of Spanish grammar or orthography. They test whether you can actually apply your knowledge and maintain proper communication in Spanish. 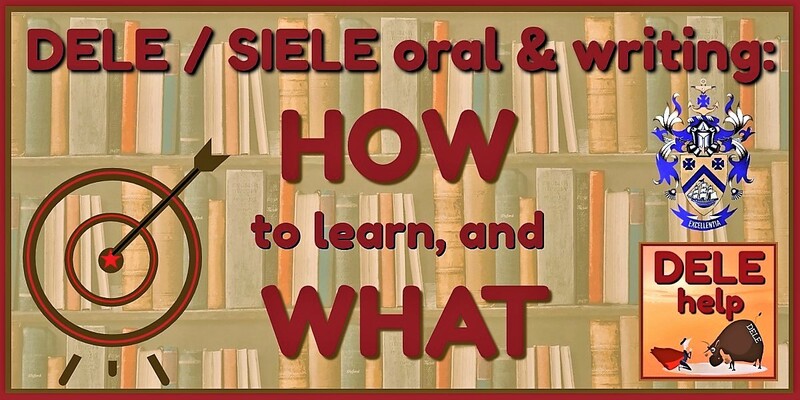 The first questions when one starts prepping for the oral and written expression tests, need therefore be – for the DELE / SIELE oral & writing: HOW to learn and WHAT to focus on, so that I can acquire the communicative competencies that the DELE / SIELE require. Even if you are not interested in actually sitting exams, but want to know how to attain fluent, coherent conversational ability in Spanish, then the same issues of How to learn and What to focus on, will apply. These are very fundamental questions, and therefore are very broad in scope. They cannot flippantly be answered in a few bullet points – to really be of help, this blog-post must first provide you with a proper understanding of how humans acquire language and the communication skills associated therewith. In other words, give a conceptual reference framework for understanding why certain things work, and others don’t, when you are trying to gain communicative competency in a new language. This blog-post will, therefore, focus broadly on explaining the language acquisition processes occurring deep inside the brain, as based on significant new research published in early 2018. Rather than simply listing “exam acing tips”, we will today step back a bit, so that we can distinguish the forest from the detail of the individual trees. We need to comprehend what fundamentally is going on inside our heads when we acquire language – so that, with such understanding, we will be better able to focus and adapt our own language learning efforts. So please bear with me through the explanations – I can promise you it will be worth-while in helping you comprehend what you need to do to gain conversational ability in real life, and thus to ace the DELE / SIELE – as much (actually, much more) than any blithe infographic of acing tips would achieve. In an earlier blog-post I wrote: There are many conflicting theories, plus ingrained teaching habits stretching back many generations, regarding how best to achieve proficiency so that you will be able to converse in Spanish. Just about the only thing that we do know for certain, is what DOESN’T work; it has been empirically proven that the traditional school or college-style teaching of a second language fails miserably in producing alumni with the capacity to maintain even a basic conversation at the end of their schooling. Recent figures from the American Council on the Teaching of Foreign Languages (ACTFL) show that only 0.5% of alumni achieve that level of competence. Most students taught the traditional way, give up on learning a second language, and those who do finish, have forgotten practically all they had learnt in just three to four years. I am very pleased to tell you that, during January 2018, a seminal new study was published that greatly advanced or knowledge of how the human brain enables us to acquire language. We now have the empirical data to resolve the “conflicting theories” I mentioned in the earlier blogpost. This research not only clearly points to what to do, and how, in order to develop your language skills – it also confirms why that which we already knew doesn’t work (namely traditional classroom teaching methods) in fact fail, as proven by the ACTFL survey quoted above. The perceived difficulty in acquiring another language as adults, lies not so much in the nature of that particular language, as it does in our human nature. As Steven Pinker and others have demonstrated (see the earlier blog-post), we learnt our own first language instinctively. In our early youth, we acquire language without formal grammar or teaching, because language is the defining “thing” of our species – it is our foremost unique instinct, like that of a spider is to spin webs. We are programmed and maximally facilitated to acquire language in early childhood. Our brains are strongly focused on it up to about age six (having satisfied also our other differentiating instinct – that of acquiring the skill for walking upright). Thereafter, however, the brain’s acquisitive capacity of necessity needs to be increasingly focused on other priorities as well, and our ability to acquire other tongues with ease, seem to us to diminish (at least, in our own perception, because it has now been proven that we engage the exact same parts of the brain to acquire any language, as we did for our mother tongue). HOW we in later life strive to acquire language, also changes fundamentally from what happened instinctively during the toddler phase – from the recognition and internalization of the patterns of our mother tongue through casual observation and then constant practicing to speak, we shift to academically “studying” the new language – as we would study History or Geography or whatever other academic subject where the goal is to abstractly KNOW (i.e., to able to recall facts and interpret them). This is NOT the way that we would, for example, learn to play the guitar, or to play golf, or to master gymnastics, or whatever other competencies that require not just abstractly knowing about, but which requires us to hone the actual ability to fluently, coherently, and correctly DO – to DELIVER OUTCOMES. How we opt to learn, and under which circumstances we in later life strive to acquire a new language, represent the biggest changes from how we had acquired our native language. Firstly the conditions and priorities have changed fundamentally – instead of instinctively spending our every waken moment for six years focused almost singularly on acquiring the ability to communicate, whilst our every human need is being taken care of for us, we now have to multi-task complex lives with many competing demands on our attention span; we have to survive economically, physically and emotionally, and try and accomplish our goal whilst being able to invest only a few hours per week, for a limited time. Imagine if you could study a new language every waken hour, 24/7, without anything else requiring your attention, while being fed, cosseted and cared for… How long would it take you then – since, as an adult, you have many more learning tools available than a toddler (such as reading, access to grammar handbooks, and to all the modern digital audio-visual resources)? Six years? No! Certainly not! So, are you still thinking that babies have you beat at acquiring language? What is true is that these adult circumstances and opportunities available to us since the advent of the age of formal schooling, have changed the way that we traditionally go about acquiring competency at communicating in the second language. It is no longer done instinctively, through observation and practice. We shift from practice-based pattern recognition, to academically studying the new language. Like for any memorizing activity, right back to ancient times (such as what plants we can eat and which not) we engage for this memory-building activity the declaratory circuit of the brain – the circuit for data storage. But – by “studying” the new language in this memory-focused traditional way, we are, unfortunately, concentrating on abstractly knowing its “rules”, rather than on building the competency to apply that knowledge in order to be able to PERFORM – to produce coherent, fluent conversation as OUTCOME. HOW BEST TO GO ABOUT ACQUIRING A NEW LANGUAGE: To understand how to go about acquiring the ability to communicate in a second language, we first and foremost have to understand how the human brain functions when it comes to “learning a language” – or, more correctly put – how we develop the ability to communicate. Understanding this process is certain to help you in cultivating the right mind-set and learning methods for making your conquest of conversational Spanish effective. It is recognized that the two most important abilities that set us humans apart from other primates and the rest of the animals in general, is our ability to walk upright and our ability to comprehensively communicate. Both are vital survival skills, and both are heavily brain-driven. The ability to walk comes quicker, because it is a much shorter process. There is proof that babies actually start picking up language whilst in the womb. After birth, the brain’s major developmental focus for the next six years is on honing the ability to communicate. A fundamental question in understanding how we humans acquire language (whether it be our native tongue, or a foreign language) is: what enables humans to have this unique capacity? Is it that we and we alone have a unique “something” in our brains – a circuit, some special DNA – that all other animals lack? This has been a rather logical assumption, and when DNA research became possible and the so-called “speech gene” (FOXP2) was identified, some had thought that it was the eureka moment – until we realized how widespread this gene is, even extending to birds, allowing them to sing. At the beginning of 2018, the result of seminal neurological research was published which once and for all dispelled the notion that we humans possess some unique “speech” part or circuit of the brain, that no other animals have. It was clearly demonstrated that, no matter our age, and whether it is for acquiring our mother tongue or a foreign language, we use two very ancient circuits of the brain that pre-date homo sapiens and even primates – circuits that are present in most animals. Although it debunks assumptions of structural uniqueness, this neurological research has some extremely important implications for our understanding of how we humans acquire language (and consequently, how it should be taught). The most important revelation is that there are two general-purpose circuits of the brain that are employed in this effort, namely the declaratory as mentioned before, but also – very importantly – the procedural circuit. These circuits aren’t solely dedicated to acquiring language, either, but are vital in our everyday functioning. The declaratory circuit is engaged when we consciously learn things that we store in our memory, such as how to count, the words of a song, or Spanish vocabulary. The big break-through has been to see how the procedural circuit “lights up” when acquiring language – the same circuit we use for mastering playing the piano, or to perfect our golf swing, or our tennis back-hand. This PROCEDURAL CIRCUIT enables us to PERFORM TASKS, and hones this ability through practice, practice, practice – like athletes building up “muscle memory” of their required moves. 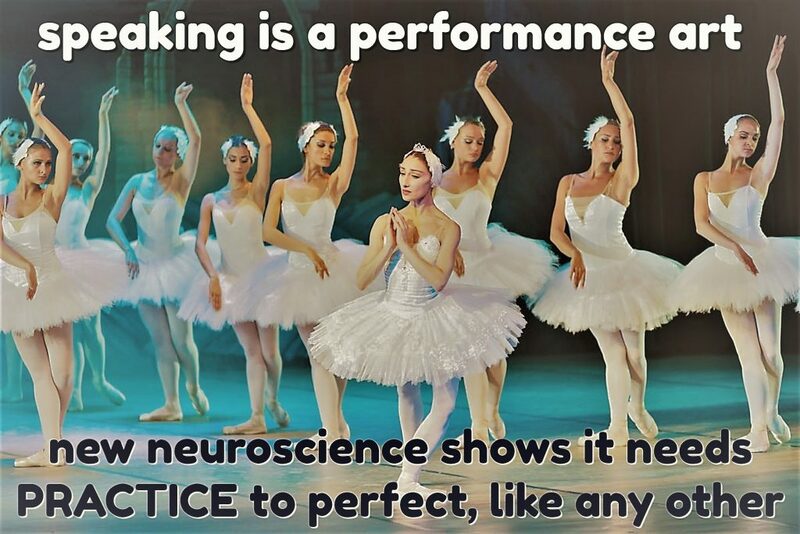 For acquiring language, therefore, we now know that it truly is also a case of “practice makes perfect”. We pick up the patterns of the language and internalize them with the objective of reflexive, spontaneous reproduction – and we do so through practice, practice and more practice, without having to think and consciously configure phrases in terms of “rules” we have tried to memorize through the declaratory circuit. 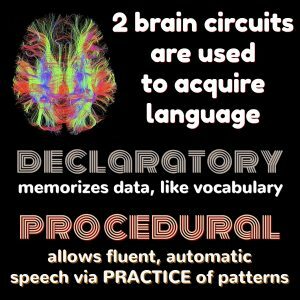 This revelation about the vital role of the procedural circuit of the brain – of actual repetitive practice – in acquiring language, goes a long way towards explaining the ACTFLA survey results, when we consider that traditional language teaching almost exclusively relies on engaging the declaratory circuit. As toddlers we principally engage the procedural circuit to pick up and practice patterns of language, and pass things like vocabulary and pattern irregularities through to the declaratory circuit to be stored. As teenagers or adults, we traditionally try and “study” a new language the other way around, namely by means of engaging the declaratory circuit to try and memorize the “’rules”, with too little opportunity to practice, practice, practice to perfection. The moral of this story, is that you cannot “study” to speak a language from books alone (that is, if you want to meet the communicative criteria of coherence, fluency, linguistic scope and correctness in spontaneous reproduction) without practice, practice, practice – just as the star pianist cannot hope to perfectly render a piece that he/she can easily read off sheet music, without also putting in the necessary practice, practice, practice. I am not going to repeat here what I said in the earlier blog-post about the importance of pattern recognition in the acquisition of language. It is a vital human ability, and you may want to read that post again to integrate what was said there, with these new research findings about the importance of the procedural circuit and of viewing language not as an academic subject for abstract study, but as a competency that needs to be actually performed, exactly like playing a musical instrument or a sport. It is only necessary to recall one’s own childhood to know that we developed the ability to communicate verbally without any formal teaching. As toddlers, we certainly didn’t formally study grammar – but from about age three and a half, we could construct phrases grammatically correctly. Where we did make “mistakes”, it usually was when the supposedly “correct” English form deviated from the general pattern we had correctly discerned – such as when a child says two “oxes” instead of saying two oxen, because the regular pattern for forming the plural in modern English is by adding an “-s” (like in two boxes, or two cows). Oxen is a relic from the past, which has somehow clung on – unlike the word “kine”, which until a few centuries ago was the correct English plural of cow, but which was jettisoned in favor of cows (with “cows” probably before then regarded as child-speak). As little kids, we didn’t think of particular verbs as being distinct conjugations of some infinitive form – we simply knew that that was the right word for that particular phrase and context, based on pattern recognition. Our ear told us if another child used a word incorrectly, without us being in any way able to explain why it was “wrong”. We developed our language skills by getting to know words as simply words, plus the familiar patterns of stitching them together in phrases. 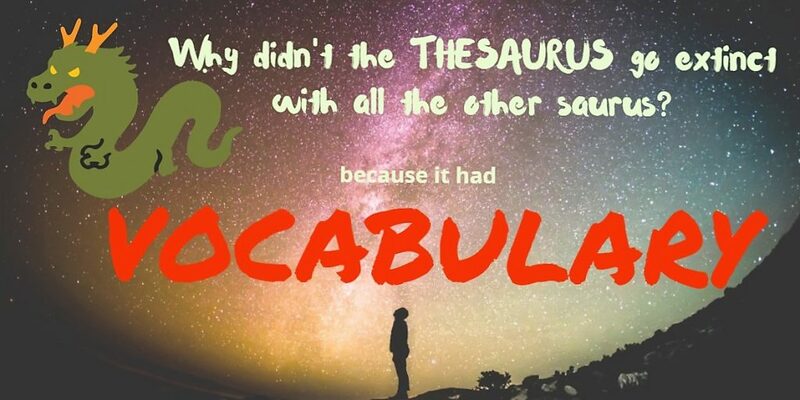 How to understand what importance to attach to the study of grammar: It is obvious that the patterns of languages weren’t ever formally designed and ordained by committees of elder cavemen laying down grammar “rules”. Languages grew spontaneously, constantly undergoing local variations and unstoppable evolution at the hand (or rather, tongue) of the common folk. The first visible signs of language standardization started emerging with the advent of printing. The first formal grammar book for any European language was only published in 1492, for Castilian (i.e., modern Spanish). In it, its author, Antonio de Nebrija, laid down as first fundamental rule that: “we must write as we speak and we must speak as we write”. What he insisted upon, therefore, is that researchers and academics should not invent language “rules”, but must observe and record that which actually exists, the patterns of speech with all their irregularities (the concept of grammar “rules” is actually unfortunate, because of the connotation that the word “rules” have of being something authoritatively ordained – with hindsight, it would have been better to speak of grammar as a faithful recording of the commonly used patterns of speech). Because of the natural eagerness of the human mind to create order by means of identifying patterns, it was inevitable that languages would eventually be formally studied. The study of grammar would come to consist of tabulating the patterns evident in any language, such as those for word modification (known as morphology – for example, the conjugation of words) or the protocols of phrase construction (known as syntax). It is evident that, by learning and knowing these “rules” or rather patterns, one would be able to predict likely constructs. Now, if we take any sport, knowing the rules of the game isn’t – in and of itself – going to make you a great player. The latter depends i.a. on one’s ability to APPLY such theoretical knowledge instantly and intuitively in actual game settings. Ditto for the guitar player – knowing the score of a song doesn’t guarantee that he/she will be able to render it perfectly at first attempt. This analogy very much resembles the demands of everyday conversation, which is focused on the speaker’s ability to instantly access his/her theoretical knowledge of grammar and vocabulary (i.e., as memorized via the declaratory brain circuit) and then – most importantly – to reproduce it spontaneously in real-world communication (i.e., the practice-embedded “muscle memory” originating with the procedural circuit of the brain). We don’t simply “know” language, we need and use it to PERFORM communicative tasks. Unfortunately, the traditional school system requires standardized curricula and methodologies. This is the case because, in order for school tuition in real life to be feasible when teaching classrooms full of students, there just isn’t much scope for individualization. They cannot all practice speaking, all at once. And there are many other subjects to be taught in the school year, in addition to (maybe) a foreign language. Therefore, for the foreign language student there cannot be anything like the constant immersion in his new tongue that the typical toddler is exposed to every woken hour in his native environment for at least the first six years. In school and college, time for studying foreign languages is limited – usually only some four to five hours per week, homework time included, is dedicated to acquiring a second language (thus engaging primarily the declaratory circuit of the brain for memorization, without truly activating the all-important procedural circuit for practicing the ability to perform). Furthermore, it is logical that schools – which are subject to severe constraints of time and organization, whilst dealing with entire class-groups and not individuals – by the nature of these limitations are focused on imparting theoretical knowledge of rules, and not on the individual coaching and practice, practice, practice required to develop actual communicative ability. As a consequence, schools and colleges are mostly teaching the theoretical foundations of a foreign language, with a focus on reading and writing (all pupils can practice to read or write at the same time, but certainly all can’t practice to speak at the same time). Quite naturally, therefore, schools are setting written exams to test students’ knowledge of the content which the schools have been teaching. Schools are not structured, nor disposed, to focus primarily on the individualized testing of each student’s ability to engage in an actual conversation, one by one. 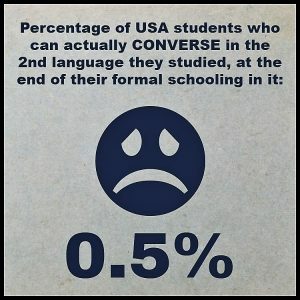 Which explains why only 0.5% of US students end up being able to converse in the foreign language they have studied. It’s like teaching and testing football spectators for their knowledge of the rules, instead of coaching actual, competent football players. The foregoing is not a condemnation of schools – in many ways the traditional grammar-based approach to foreign language teaching was and is what is practically possible, and no informed teacher is under any illusion that it would, in and of itself, be enough. Because humans instinctively seek for patterns, formal grammar is clearly a very useful tool that helps identify and present for study, the patterns inherent to any language. It is thus very important that grammar be learnt (particularly because it provides a short-cut to knowing and identifying the irregularities inherent in any language). It obviously is a faster way of becoming aware of such patterns and their exceptions, than simply by absorbing them subconsciously, over the course of years of unstructured immersion. But it evidently is not enough to simply know these grammar rules, or even to have academic awareness of the patterns, if one wishes to acquire the capacity to fluently, correctly and coherently engage in actual conversation – to communicate effectively and reflexively. As I said in the earlier blog-post, another major drawback inherent to the traditional way of teaching, is that it inevitably leaves the student with the impression that language consists of rules and vocabulary – of individual words, which must be strung together in accordance with set rules, such as that of conjugation. In reality, though, language for the most part consists of “chunks” of words in the form of well-established phrases with agreed meaning. These chunks of words and the customary way in which they are strung together, form an important part of the patterns of a language. As kids, we pick up and become skilled in using these “chunks”, like: I am going to school; I am going in the car; I am not going to grandma’s etc. We comprehend that the basic chunk stays the same, we only have to change some words to suit the need of the moment. This truth was recognized some two decades ago by Michael Lewis, who called for a new, complementary approach to the traditional way of teaching foreign languages, which he called the “lexical approach”. You may want to refresh your memory about this part of the earlier blog-post as well, because in your preparation for the DELE / SIELE, you will notice the emphasis that examiners are placing on the use of “link phrases” to enhance fluency and coherence – and such “connectors” are prime examples of the word chunks that the lexical approach has been focused on. The lexical approach is not intended to replace traditional learning, but to supplement it; Lewis and his followers see it more as an enhanced mind-set, a better understanding of how we actually acquire language, which would broaden the learning methodologies beyond their traditional focus and strive for an outcome of actual conversational competency. The WHAT of becoming proficient at conversation: The first thing to get right, is mind-set. Your objective should NOT be “I want to study Spanish” (because that is only aimed at acquiring theoretical knowledge about the language). You should consciously decide that “I want to develop the capacity to converse in Spanish” (which entails not only knowing the theory, but the practiced and honed performance skill, of integrating and applying your knowledge in real-world situations, instantly and spontaneously). What you want to be, is an accomplished football player, not just a coach potato football rules guru. With your mental objective clearly defined, it is important next to identify the skills and knowledge sets that are essential for you to develop, in order to acquire the ability to converse in Spanish. These elements then become the “to do” list of your preparation plan. The ultimate phase will be to add to this “what to do” list, the very important “how to do” component. What, then, is necessary, in order to be able to actually maintain a conversation in a foreign language? You must firstly have the ability to understand what your interlocutor is saying to you, and secondly you must be able to make yourself understood. For both understanding and being understood, you first of all need a sufficiently ample “linguistic scope”. This means that you do have to know (i.e., that you have learnt, to the point of having committed to memory and thus have fully internalized) the words, expressions and common “word chunks” making up the general use lexis of the language. You need to do so with sufficient width and depth, so that you can easily identify the words and word chunks upon hearing or seeing them, and also instantly reproduce them when needed in your own oral expression. This essential knowledge of words and patterns entails knowing the semantics (or meaning) of words, the phonology (or sound) of the word, plus its orthography (spelling, for recognizing it when reading). Your knowledge of Spanish words and word chunks (lexis) is one of the two theoretical knowledge legs upon which real conversation stands (or falls). The other leg is knowledge of the patterns of the language, so that you can string the word chunks together correctly. 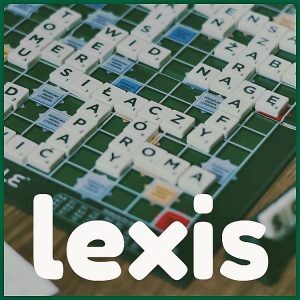 But lexis may be more vital to conversation, because your listener can, as an intelligent native speaker, compensate for your small grammatical errors of syntax or of such things as gender accord, even for wrong verb conjugation – however, what he or she cannot compensate for, is if you completely lack the appropriate words to say what you want, or pronounce them so incomprehensibly that your listener’s eyes simply glaze over. When you are preparing for a modern Spanish exams of actual communicative competency, such as the DELE / SIELE, you will know that the amplitude of your linguistic scope is one of the four equally-weighted scoring criteria that examiners will be applying, when scoring you written and oral expression tasks. However, these two legs of stored knowledge, although clearly required, are not of themselves enough to allow conversation. In order to converse, we now understand that – like any athlete – you will have to practice these legs to perform spontaneously. In fact, if you are still obliged – when you want to say something in Spanish – to first try and remember the right words, and then to calculatedly apply these grammar rules in order to mentally construct a phrase before you can utter it, you will have a serious problem with fluently maintaining any kind of conversation. This is the difference between sitting a traditional end-of-school written exam, where you have time to calculate how to apply rules, and real-world conversation, which is an instantaneous give-and-take. Instead of relying on calculated application of rules (which usually signify that you are still thinking in your mother tongue and first have to translate from it) you need to have fully internalized – through practice – the patterns of Spanish speech (as you had done as a kid, with your mother tongue). Having internalized these patterns, it rolls out correctly almost without conscious thought as to how to say something (thus leaving you free to focus completely on the really important thing, namely the substance of what you want to convey). From this, you will understand that being grammatically correct is just one part of the “correctness” criterium applied in the DELE / SIELE exam (other elements of correctness being spelling, pronunciation etc.) which means that grammatical correctness is assessed at one-third value of one quarter of the overall scoring under the four equally-weighted main criteria (the other two main criteria, alongside linguistic scope and correctness, being coherence and fluency). In real life, conversation breaks down when there is no fluency and coherence – when you have to constantly interrupt your interlocutor because you could not understand something that he/she said, or when you yourself cannot find the right words or correct pronunciation or appropriate syntax to comprehensibly say what you need to say. Once again, if you need to first translate for yourself and do a rules-based calculation of how to say something, then there will be no fluency. You need to have the lexis and patterns of Spanish sufficiently internalized. Especially important to the fluent flow of conversation is the appropriate use of link phrases in order to fluently join up different thoughts or sentences – and not end up uttering, in staccato style, a disjointed series of unconnected phrases. You know from conversation in your own language, how important link phrases are – words such as “accordingly”, or “on the other hand” or “as you know” or any of the many such devices that we use to fill blank “think time” between sentences, and to link them together, in place of uttering “uhm” and “aah”. These are some of the most fixed and most used “word chunks” in the lexis of any language, and knowing these patterns are essential to fluency. To recap – the what of Spanish that we need to internalize in order to be able to maintain conversation, are the patterns and the lexis of the language. The latter is the words and word chunks (including their meaning and pronunciation). The patterns are those of syntax (how words and phrases are strung together to form coherent sentences) and of morphology (how we transform words to signify different meanings). This knowledge of lexis and of patterns we have to commit to memory (i.e, with the declaratory brain circuit), and then with the procedural brain circuit, through guided practice, hone the ability to reproduce it instantaneously without much conscious thought. Without such well-honed internalization of the lexis and phonology of Spanish and of its morphological and syntactical patterns, you cannot hope to achieve fluency. The HOW of developing the ability to converse in Spanish: Developing the knowledge and skill sets required to maintain a conversation in Spanish, needs to engage both the declaratory and procedural brain circuits (i.e., learn and practice). Luckily, as adults we have access to certain facilitating and enhancing tools which toddlers don’t have available. Adults can read, can follow TV and live stream radio, can do classes (nowadays, also via Skype, from the comfort of the own home). In fact, it may be a misconception to think that babies have an advantage over adults, when it comes to acquiring a language, given the learning tools that adults can access. The one true benefit that babies have, is that their brains can focus almost exclusively on mastering verbal communication because of their adult-facilitated environment without a care in the world, whereas adults have a huge array of responsibilities between which they must divide their mental energy. Internalizing the patterns: The basic manner in which your Spanish will develop, will be by means of assimilating patterns and practicing their spontaneous reproduction. You can check with just about any fluent speaker of Spanish as foreign language – they will tell you that they don’t consciously construct sentences based on grammar rules; they speak Spanish the same way as they speak their native English. They do so intuitively and without conscious mental effort, focused on the substance of their message and not on form. They probably will have to do a double take if you start cross-examining them about the intricacies of the morphology or syntax they had just used – the same as you would, if they do the same to you about your native English (you’ll probably respond that you can’t recall why something needs to be said in that particular way, but that you know for sure that that’s the way it’s said!). The importance of practice/immersion: To discern patterns, and especially to internalize them in this natural manner, we have to be scanning a vast amount of Spanish. This can only be achieved through immersing yourself in an environment where you regularly hear, see and have to speak Spanish, just as a toddler masters the patterns of his/her mother’s speech. It is therefore evident that any attempt to acquire a foreign language with an approach based just on classroom + homework time (i.e., just employing the declaratory brain circuit without the addition of guided practice via the procedural circuit), is not going to result in any better performance than the figure of 0.5% of U.S. students reaching conversational ability, as cited in the earlier blog-post. The relative importance of, and correct view of formal grammar: Again, this is not to suggest that formal grammar should or could be substituted. Grammar as we know it is none other than a handy codification of the enduring patterns of a language, as these have been observed over time by qualified linguists. Using the fruits of their labors will clearly help you identify and understand the patterns (and their “irregular” exceptions) a lot quicker than you would be able to do with just your own random observation. The key, however, is mental attitude – you have to study grammar as a very valuable tool, which will help you spot and comprehend the patterns far quicker and easier. Do not study grammar as if it represents the language as such, as if knowing the “rules” of grammar could or should be – in and of itself – the ultimate objective. Please realize that knowledge of grammar is no more than a convenient crutch in the early phase of language acquisition, while you are still hobbling along because of not yet having fully internalized the patterns. Just as you did with your English grammar crutch, you will be discarding it (actually forgetting all about it) as soon as you – figuratively speaking – can walk upright with ease and comfort without it. How many adult native English speakers do you think ever give a moment’s thought to English grammar in their day-to-day conversations? When last did you, yourself? Always remember, too, that the language patterns codified under the title of grammar (essentially being word morphology and sentence syntax), are intellectual constructs developed almost organically over ages by communities of humans. Since grammar “rules” are intellectual constructs, any intelligent man, woman or child can therefore mentally compensate for most errors they hear in your grammar, without losing track of the meaning you are trying to convey. Studying grammar isn’t the be-all and end-all of “studying the language” (this is particularly important to understand when prepping for exams such as the DELE/SIELE, as illustrated by the fact that grammatical correctness is just one element in the “correctness” criterium, with coherence, fluency and linguistic scope each carrying equal weight to correctness). It isn’t even the most important part of such learning (as evidenced by the ability of others to mentally compensate for your grammar errors, as well as by how quickly this crutch is discarded from your active consciousness, once you’ve reached fluency). Nevertheless, don’t be mistaken – until you are fluent through having fully internalized these patterns of morphology and syntax through constant guided practice, you HAVE TO STUDY YOUR GRAMMAR – but do so selectively, as we will show you during your tuition, and with the right mental attitude, namely that grammar is a valuable “cheat sheet” of essential patterns and irregularities. The most vital aspect that you have to focus on in your active learning (i.e., when pumping that declaratory brain circuit) isn’t grammar. It is expanding your Spanish lexis. As was said earlier, to be able to maintain a conversation, you firstly need to comprehend. If you don’t know the meaning of a word or phrase your interlocutor has used, there is no way you can mentally compensate in order to arrive at a correct understanding of what you’re hearing (apart from asking your interlocutor to repeat and explain). It is therefore axiomatic that, to understand, “you have to have knowledge of words and the world”. 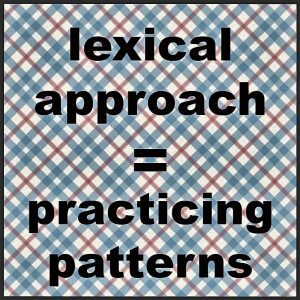 This is just another way of underlining the lexical approach, which goes beyond the semantics of any given individual word to include its situational context, which helps give it specific meaning within a particular pattern of use. If you don’t have adequate lexical knowledge (i.e., knowing the situational meaning of words and phrases that you hear), and don’t know enough about phonology to be able to correctly identify which words you are actually hearing, you cannot hope to comprehend much in the course of any given conversation. Neither will you be able to do well in the multiple choice listening and reading comprehension tests that make up 50% of the DELE / SIELE exams. When expressing yourself orally, lexis is also of vital importance. You have to readily know the right word or phrase (to the point of not having to break your flow to search your memory for it), and you have to be able to pronounce those word chunks intelligibly. If you don’t readily have the right words and phrases at your disposal, or you cannot pronounce them sufficiently correctly for your interlocutor to be able to identify them, then – even with the best theoretical knowledge of grammar – there is no way that your conversation can blossom, simply because your interlocutor cannot mentally compensate for words that you don’t have and which he cannot divine. He will be as lost as you are. At this point it is important to underline that one should have realistic expectations about the time and effort it will require to reach conversational ability in a foreign language such as Spanish, since far more is involved than just learning grammar rules and lists of vocabulary with the declaratory circuit of your brain (you have to engage the procedural circuit through practice, practice, practice to be able to spontaneously produce the right phrases). The ACTFL has calculated that a student of average aptitude will require 480 hours to reach “advanced low” proficiency (A2/B1 level in the European Common Framework such as the DELE diploma). This translates into doing forty hours per week (8 hours per day) for twelve weeks solid. To achieve “advanced high” level (i.e., not yet “superior”), will require 720 hours for the average student, starting from scratch. For the superior proficiency level that diplomats and the like require, it is generally thought that 1,000 hours of intensive preparation is necessary. The reason for this many hours, is that these institutions (such as the Foreign Service Institute of the USA) aren’t teaching their students the same way as schools or colleges do; through experience, they have come to understand the vital importance of practice – therefore, a diplomat doesn’t need 1, 000 hours of book study, but rather that total amount of time for both memorizing and guided practice of actual communication. What constitutes immersion, in the internet age? Immersion doesn’t only signify visiting a Spanish-speaking country and living there for some time. You can immerse yourself totally in Spanish-language books, films, talk radio and news. This is more focused and productive than merely living in a Spanish-speaking environment, because you can select appropriate themes and you can have your learning tools at hand, such as for jotting down and looking up new words, and adding these to your flashcard list. This combines the mental awareness of the importance of a lexical mind-set and the practice routines of engaging the procedural brain circuit, with all the other traditional learning tools focused on the declaratory circuit. There is no doubt that the more time you invest in reading Spanish, the more you will internalize the lexis and patterns of the language, as well as getting to know the Hispanic cultural context – especially if you have given sufficient attention to your grammar as a great tool for helping you to quickly spot and understand those patterns. Reading has the huge benefit of seeing the words, but you need to hear them as well for the sake of phonology (you therefore have to maintain a balance between listening and reading). For this reason, the Spanish telenovela (TV soapy) is a great learning tool, especially those that have subtitles for the hard of hearing, so that you can see and hear the word, and also see its situational context playing out on screen. In any event, whenever you read, read out loud – this provides good practice to your “articulation tools” to adapt themselves to the Spanish sound system, in the privacy of your own home and thus without any risk to your ego. Better still: tape yourself reading out loud, so that you can pick up your pronunciation errors – you will be surprised how different we all sound in reality, as opposed to how we imagine we sound! Luckily, such “home immersion” in Spanish is nowadays a free option, thanks to the internet. You don’t have to go live in a Hispanic country anymore (if you don’t want to, that is). Check out this DELEhelp blogpost for a host of links to free sites, ranging from streamed talk radio, through the major Hispanic print press to free e-books and telenovelas. One needs to differentiate between active learning (such as working on your flashcard lists of lexis and memorizing them, or doing homework exercises in grammar, in reading comprehension or writing) and passive immersion. The latter can form part of your relaxation, like reading a book in Spanish (if you are a beginner, look for dual text books that have Spanish on one page and the English on the opposite). Every possible minute that you can have Spanish talk radio streaming live, or the TV running telenovelas in the background, is useful – even if you can’t really concentrate on their content, you will pick up phonology as well as words, phrases and patterns. Knowing how kids learn, you shouldn’t underestimate the value of this. One of the great killers of people’s ambition to master a foreign language, is frustration (next to boredom, especially if they just do grammar exercises!). Frustration can really grow very quickly if grammar mastery is (wrongly) seen as the be-all and end-all of gaining proficiency in Spanish. You may know, for instance, that every Spanish verb can literally be conjugated into 111 different forms, given the number of different moods and tenses in Spanish. If you get stuck on the idea that you absolutely have to memorize each and all of these 111 possibilities in order to be able to converse, the task will seem so daunting that very few will not become frustrated. Develop your own style of speaking, that’s natural and comfortable for you: Here’s another tip – each of us, no matter our language, have a particular own style of speaking that we’re comfortable with. We don’t use all the possible tenses in normal conversation (as some writers may do in penning high literature). Similarly, when conversing in Spanish, you don’t need to have all 111 conjugation options rolling fluently off your tongue. This is especially true in the beginning, while you are still internalizing the basic patterns of Spanish. Beginners and intermediate-level students, in order to start speaking with coherence and fluency, may choose to concentrate on mastering the present, the idiomatic future and the perfect tense of the Indicative mood. If you can conjugate these three tenses well, any interlocutor will be able to understand which time-frame you are referring to. These three tenses correspond very well to the way you are accustomed to use tenses in English, because both the idiomatic future and the perfect indicative in Spanish are compound tenses, using auxiliary verbs (just like in English, which also use compounds with auxiliary verbs to indicate past and future – auxiliaries like “shall” and “have”). This way of speaking is in fact becoming more common in Spanish, so you won’t be regarded as weird – in the Americas, for example, the idiomatic future (futuro idiomatico) is already used exclusively, in place of the traditional conjugated future tense. For the idiomatic future, you only need to learn the present indicative conjugation of one verb, namely “ir” (to go). We must emphasize, though, that this approach works when you yourself are speaking; however, because you cannot control the tenses that your interlocutor may choose to use, you have to have sufficient knowledge of the other tenses to at least be able to recognize them, otherwise you may not comprehend what you are hearing or reading. In any event, it is much easier getting acquainted with something to the point of being able to recognize it when used by others, as opposed to the level of active learning and especially practice that’s needed for the purpose of own speech, which demands full internalization to enable spontaneous, real-time reproduction that’s coherent and fluent. For proficiency at conversation, you have to practice speaking (and be expertly guided / corrected): The immersion that we referred to above, needs to go beyond you simply absorbing written and spoken Spanish. To acquire the skill and confidence to maintain a conversation, you have to have guided practice in actually speaking. This is often a problem for a home-study student living in an environment where there are few speaking opportunities. Again, though, the internet comes to the rescue, in the form of Skype and its equivalents. Such online tuition and interaction is actually better than what most classroom tuition situations can offer. In the typical classroom, you are part of a group, dragged down by the lowest common denominator and by methodologies and curricula that of necessity are generalized, without focus on your particular needs – unless you are fortunate enough to have one-on-one tuition, such as at our partner residential school in la Antigua Guatemala, PROBIGUA (click on this link for a 2-minute video). The great benefit of having your own expert, experienced online tutor (apart from the low cost and the convenience of studying in the comfort of your own home) is that you have someone you can speak to, who will know how to record (i.e., tape), correct and guide you. A relationship of confidence soon develops, so that the natural inhibitions of ego fall away and you can really freely practice to speak. We have already mentioned the vital importance of pronunciation – it is clearly very difficult to perfect this if you don’t have a live human being listening to you and guiding you (no matter what the computer-based interactive packages may claim about their pronunciation verification software). It is also true that interactive computer packages can tell you if you are answering correctly or incorrectly, in relation to simple things like vocabulary, but can they explain to you? Obviously not. The need for expert assessment and guidance in language practice is no different to the same need for the golfer we mentioned, practicing his swing (for both, it is the procedural circuit of the brain that’s engaged). If an amateur golfer (“hacker”) like myself should try and practice my swing on my own, I will just re-enforce my bad habits. I need a pro to video-record me, show me where I go wrong, and guide me to correct it, to make my hours of practice worth-while – the exact same applies to language practice. Getting over the barriers constituted by the own ego / the “fear of failure”: A last tip with regard to speaking practice, concerns the barrier in the adult psyche constituted by our natural fear of making a fool of ourselves in front of others. This is perfectly normal, and its inhibiting power is great. There are three distinct ways of overcoming this barrier. The first is to build a relationship of comfort with a trusted tutor, as I mentioned earlier. Another is to get objective proof of your communicative proficiency in the form of certification, such as the gold standard DELE / SIELE diploma of the Spanish education ministry, or the Oral Proficiency Interview (OPI) in the USA. This knowledge that you’ve proven that: “yes, I can!” will boost your self-confidence no end. A third option (which can be integrated with the first) is to create a situation where you, John Smith, aren’t making the mistakes – “somebody else” is, so it’s no skin off your nose. This approach, which is called suggestopedia, was originally developed in the 1970’s by a Bulgarian psychotherapist by the name of Georgi Lozanov. What it entails, is that John Smith will, for example, arrive at the diplomatic academy, where he will immediately be given a new identity related to his target language – he will become Pedro Gonzalez, a journalist from Mexico City with a passion for football and politics, and an entire back story that John Smith has created for his Pedro identity. All his fellow students and tutors will know John Smith as Pedro, and interact with him as such. This has the benefit of taking John’s ego out of play, plus the benefit of freeing him up to adopt a Latino persona, so that he can escape from his unilingual Anglo cultural and phonological straightjacket and learn to articulate (and gesticulate) like a true Latino. Suggestopedia isn’t the answer to all the methodological challenges of learning a foreign language – it is simply another tool, to be used in conjunction with others. I have seen its effectiveness during my days as head of South Africa’s diplomatic academy (before I became ambassador for the New South Africa of President Mandela). I’ve also seen it here at DELEhelp – one remarkable fellow really got into the swing of things, designing for himself an identity as a Mexican footballer (soccer player). Every time, sitting himself down in front of the Skype camera, you could see him with his enormous sombrero on his head, dressed in his Mexican club soccer shirt and with a glass of tequila in his hand. It wasn’t difficult for him to really get into his new character, which completely freed him of his uni-lingual Anglo straight-jacket and assisted him enormously in mastering the articulation of Spanish phonology in no time. If you think it can work for you, give it a try! Like any endeavor in life, learning a new language requires more than just guts and determination (although a lot of that, as well!). It requires that you understand the challenges, and the science behind what works and what doesn’t. I hope that this rather long blog-post has helped you acquire such understanding. We here at Excellentia Didactica / DELEhelp would be more than pleased to help you with engaging the procedural circuit of your brain through guided practice, so that you can master the performance art that conversing fluently and coherently in Spanish truly is. 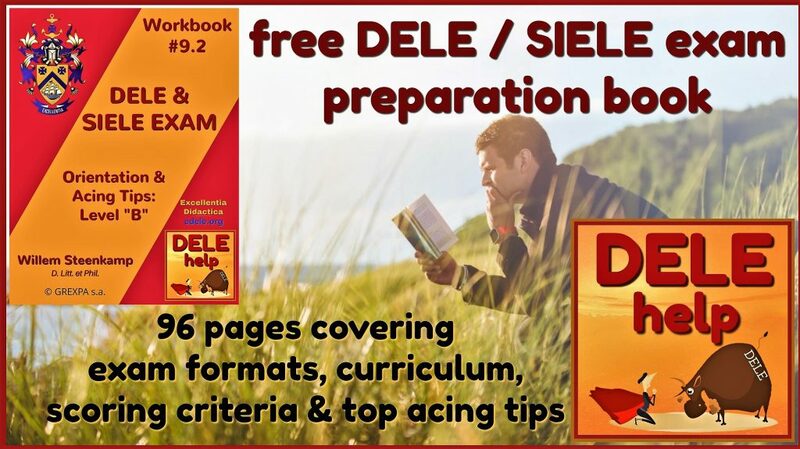 REMEMBER TO ASK FOR OUR FREE 96-page DELE / SIELE EXAM ORIENTION AND ACING TIPS WORKBOOK.